Tonight on CBS their hit drama Criminal Minds returns with an all-new Wednesday, May 3, 2017, episode, called “Green Light,” and we have your weekly Criminal Minds recap below. On tonight’s Criminal Minds episode season 12 episode 21 as per the CBS synopsis, “When Reid fears his mother has been abducted, he asks the BAU to investigate while he is stuck in prison. Reid’s mother was in trouble. Her nurse had apparently disappeared and she was suddenly being taken care of by this new person her son happened to know. However, Lindsey Vaughn wasn’t just anyone. She was someone that Reid had saved many years ago and who was supposed to be in the Witness Protection Program though Reid hadn’t seen nor heard from her since 2007. So he had been little confused at first about how she came to be his mother’s nurse and why she was calling herself Carol Atkinson. And so it didn’t become clear to him what was happening until Carol managed to get away with his mother. Though Reid hadn’t wasted any time when it came to talking to his friends about this new threat. He told Prentiss that he didn’t know why Lindsey was targeting him or his mother, but he admitted that Lindsey could have been the woman that drugged him in Mexico and so that led to even more questions. Like why would she target him and if she was working with Scratch. It had been Scratch’s drugs after all that had gone to work on Reid and had left him in a disorientated state. So Reid didn’t know what to believe when it came to Lindsey meanwhile Prentiss had been a little skeptical. Prentiss has been worried about Reid since he went to prison and she was concerned about what he had “seen”. She didn’t know if he had actual seen Lindsey or if prison was getting to him. But Reid had proved his sanity. He remembered everything about Lindsey’s case and so he had reminded Prentiss that Lindsey had once been abducted with her friend Katie and that Lindsey’s father ended up killing the Unsub out of vengeance. So Prentiss looked into the matter and she found out that Carol was an alias yet she was more concerned about finding Cassie. Cassie was Reid’s mother’s nurse and Prentiss suspected foul play once she proved that Lindsey had manipulated her way into Reid’s life. Yet, Garcia had gotten some information on what Lindsey had been up to. Lindsey had seemingly rented an apartment a few doors down from Reid without him knowing and she had done so under another alias. She had gone by Jamie then and the profilers had found Cassie’s body in Jamie’s apartment however, Garcia had come across some good news. She had found out that Lindsey had been using her father’s gun. Which make sense. Lindsey was daddy’s girl after all and so she would use his gun if she believed that she was carrying on his legacy. However, the gun had showed up in fifteen other murders that went on to prove that Lindsey became a cartel hitwoman. So Prentiss and Alvez had demanded information on her and her father from Witness Protection and they found out that Lindsey aged out of the program and that she had willing left home several years ago. And so Prentiss had gone back to Reid to tell him what they found though she hadn’t found him in a good shape. Reid had previously poisoned most of his cell block and the guys had finally come out of the infirmary. So they were looking for revenge and Reid knew he wasn’t safe, but Prentiss had tried to do something about it when she found out what happened. She had talked to the guards and had tried to arrange protection for him. Though the guards didn’t want to grant Reid special privileges so he came up with his own solution. Reid later stabbed himself in full view of the guards and that got him solitary confinement. But Reid told Prentiss to find his mom at their last visit and so that’s what she focused on. She and the others looked into why Lindsey became what she was and how did she become involved with Scratch. Scratch could have easily chosen someone else with a closer attachment to Reid yet he chose Lindsey and she was barely connected to Reid. Reid had tried to rescue her and her father had gotten to the scene first so both he and Lindsey were a witness to her father murdering the man that kidnapped her. And so Reid had remembered what he said that day. Reid had tried to talk Jack Vaugh out of the murder and one of things he said was that Lindsey would forever be changed if she had to witness it. Yet, Reid didn’t think she would be that changed and so that confounded him as well as everyone else. The team looked into ever possible connection and they couldn’t tie Lindsey to Scratch however they could tie her to the other murders. They tied her to murders in the States as well as Mexico and one man she killed had been connected to what happened to Reid because she had used her victim’s car to get to the other crime scene. So Prentiss had taken everything they found and she had brought it before a judge as evidence of Reid’s innocence. However, the ADA had tried to fight her on it and had said that she had nothing concrete. He implied that everything the BAU found were theories and so he pleaded with the judge not to believe Prentiss though ultimately the judge decided to work in Reid’s favor. The judge had freed Reid and he had gotten out before Shaw could pay him back for poisoning everyone that took the drugs except Shaw then had to deal with Alvez. And so he was getting transferred while Reid was finally freed. Only he couldn’t officially do anything. 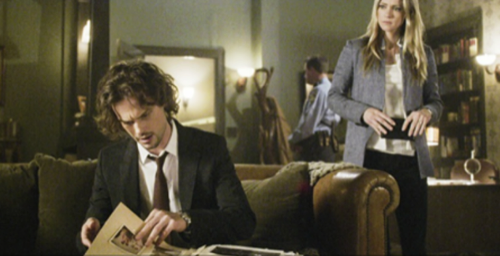 Reid hadn’t been reinstated and so he’s back with the bureau, but he could go back to his apartment which had been sealed and so he looked for something there. Though he found something that Lindsey must have planted indicating that she was with Scratch and the team had thought they caught a lucky break when they found a lead on Lindsey’s whereabouts and thought that they could lead them to the both of them. So it had confusing when the team found the house and not their perps. But they had decided to play Lindsey’s game seeing as she had set something up for them. She had had apparently left two strangers that looked like her and Scratch and they had been at the house to show the BAU the video. The video was of Cat Adams and she told them that she was tired of pretending to be Scratch and had wanted Reid to know what she did to him yet Cat had also said that Reid could come to her whenever he liked to find out what happened to his mother. And therefore, Reid had had to go back to prison to speak to her.